This is the "Gin Pole" for Lifting one 25G or 45G Tower Section at a time. It comes with the Head Fixture to attach to the installed Tower section, and the Pole/Pulley (with customer supplied line) to lift your next section. 12 Foot in Length for lifting one 25G and 45G Tower Section at a time. Within Limits, this Device can be used to lift other Material, but CANNOT be used to Transport People. Per Rev. G guidelines, any structure greater than 10 ft requires a climber safety device. Please see page 19 of the Buyer's Guide for ordering information. 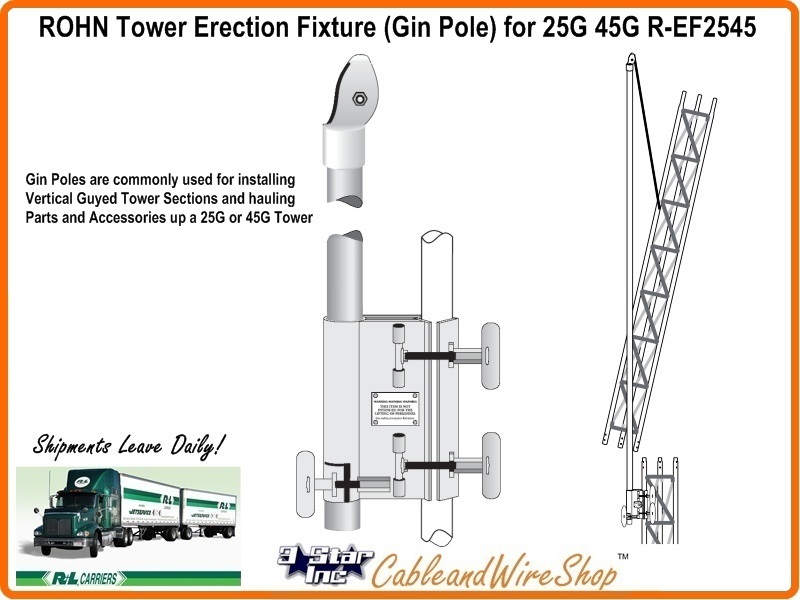 Note: This Tower Erection Fixture is used with 25G and 45G Tower Installations. As this Item is over 10 feet in length, it can only ship by LTL Freight. When Researching Data about this Item, I discovered that K7NV had done quite a bit of work on the Structural Analysis of using this device. We include the link here solely for Educational Purposes. Gin Pole Analysis Trust No Substitutes. Buy ROHN. Buy American.